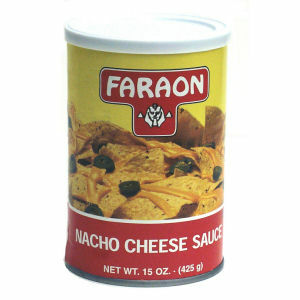 Faraon offers excellent quality and great tasting nacho cheese sauce! A "required" ingredient for your nacho chips or as an addition to some of your meals, such as hot dogs. Heat and pour over your favorite Mexican style chips and sprinkle on some Faraon Nacho Sliced Jalapenos for the most delicious nachos you've ever tasted! Quality guaranteed.